As I understand it, Tor uses the same circuit for about 10 minutes or as specified in the MaxCircuitDirtiness option in the torrc file. However, I noticed something strange while trying to use curl to fetch a site while running tor on a separate terminal window. Initially, the circuit being used was this (with the torrc file set to use an Exit Node in France). Where Wix is supposed to be an Exit Node in France. I figured this out by first listing the current circuits inside tor, and then using a script to list down the exit node currently being used (Both by using Stem's API). Since the Exit node being used for my connection was Wix, I figured that this was indeed the circuit being used. A similar thing (as in a sudden switch between the normal French exit-node being used) happened with another node (named clive above). This node too had a one-node circuit, and in addition it was present as a Guard node in all the other circuits in the list. Could anyone please let me know what could be going on? 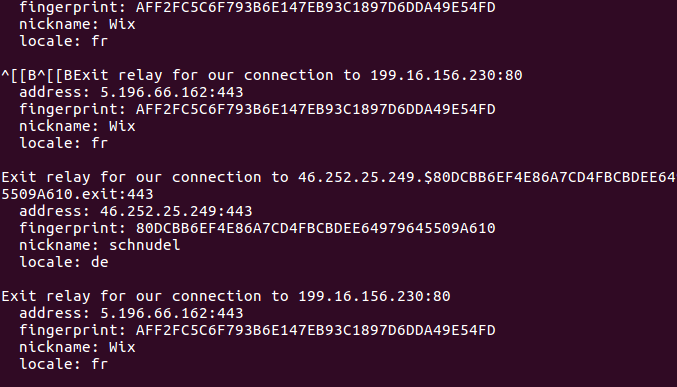 Why doesn't Tor's circuit stick to the node in the country that I had specified in the torrc file? Why does it suddenly switch to a node in Germany? Or Lithuania in the case of the other node. Does Tor use one-node circuits sometimes on its own? Does this kind of thing normally happen? Browse other questions tagged circuit or ask your own question.